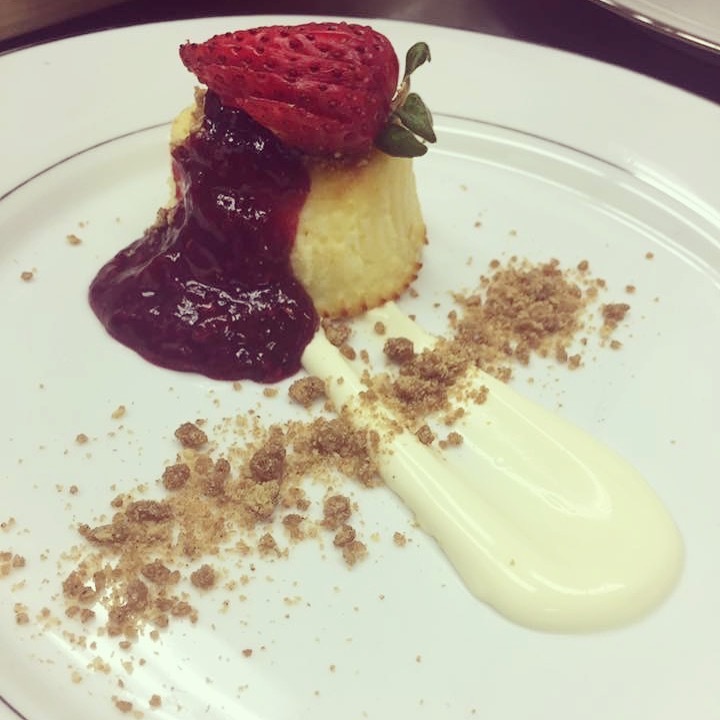 VC Gourmet hosts monthly fine dining experiences. Typically held on a Saturday evening starting around 6:30 pm, these events are limited in seating to about 30-40 guests and fill up fast. Reservations and payments are required at least 24 hours ahead of time, no walk-ins are able to be accommodated the night of the event. Unique menus are created for each evening and the price is set accordingly per person. There is only a single seating time for the evening because the meal takes several hours to get through. Everyone takes there seats and is served each course at the same time. Private dinners for larger groups are also available. Passed around the room before the meal begins, usually consisting of delicious treats like Mini puff pastry with goat cheese and orange marmalade or grilled shrimp with avocado relish. The third course of salad is light and refreshing, a Mixed green salad with blood orange or Heirloom tomatoes, burrata and basil cleanses the palate and prepares you for the main course. The meal begins with a generous antipasto board consisting of an artisan assortment of fine cheeses and prosciutto di Parma. All item are stocked and sold daily in-house. The MAIN COURSE, a hearty portion of protein. Filet Mignon served over crispy fried onions or parsnip puree, tourne glazed carrots and a demi glace ensure a satisfying and memorable meal. A second course of seafood is prepared for the evening, Maryland style crab cakes or Seared scallops are frequently featured. These options are dependent on seasonal availability. We save the best for last, a meal wouldn't be complete without dessert! Chocolate salted caramel mousse or House-made cheese cake with a berry purée and coffee finishes the evening. Sign up with your email address to receive our next fine dining menu before released to the public along with the opportunity to reserve early.